MANILA, Philippines — A former senior Philippine police official said President Rodrigo Duterte, who has faced widespread criticism over his deadly drug crackdown, has been photographed with two Chinese men involved in illegal drugs and that he sent a report to warn him about the two. Dismissed Senior Superintendent Eduardo Acierto said late Sunday that he's unaware what government action has been taken after he submitted his report about the Chinese men to top police officials starting in December 2017. 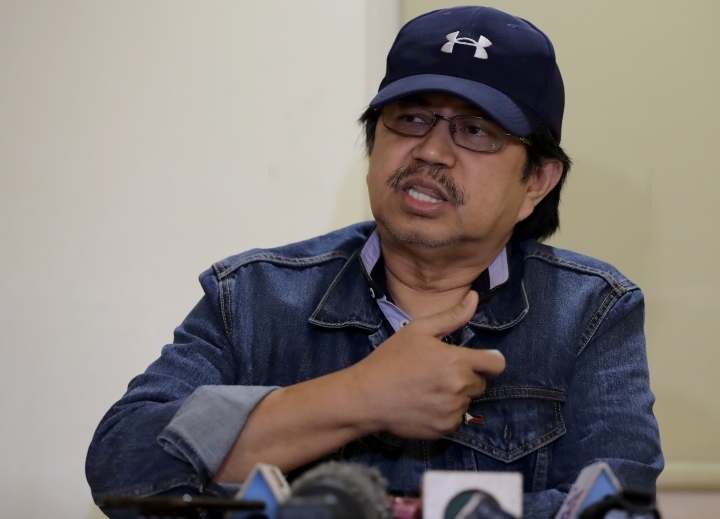 Instead, Acierto said he's now facing illegal drugs complaints and has been the target of death threats that forced him to go into hiding recently. 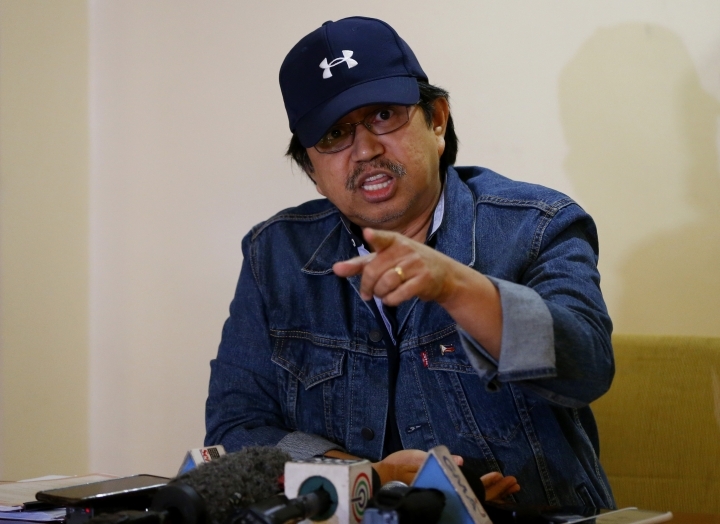 "In my investigation, I discovered that our president ... is often accompanied by two people deeply involved in illegal drugs," Acierto, who was a veteran anti-narcotics official before he was dismissed last year by an anti-graft agency, said in a video message shown to reporters before he appeared at a news conference in Manila. "What popped into my mind at the time was maybe the president isn't aware that these are suspected drug lords." Philippine Drug Enforcement Agency Director General Aaron Aquino told The Associated Press that he received Acierto's report and sent it to Duterte's office, adding that both his office and that of the president took steps to validate the allegations against the two Chinese. An initial check showed that at least one of the Chinese was not facing any illegal drugs case in the country, he said. There was a suspected drug dealer in the northern Philippines with the same name as one of the two Chinese Acierto identified in his report, but Aquino said investigators would have to check if they were the same person. "It's wrong to say that there was no action taken because it was acted upon," Aquino said. He played down the significance of the photographs showing Duterte with the two Chinese men, saying officials often get approached by all sorts of people for group photographs without being able to rapidly check their background. "I get to be asked for selfie shots and I wouldn't know that the one I'm being photographed with is a drug lord," Aquino said. Aside from his alleged involvement in the irregular issuance of gun permits that led an anti-graft prosecutor to order his dismissal last year, Acierto also faces criminal complaints for his alleged role in the entry of a large amount of methamphetamine through the Bureau of Customs in Manila, Aquino said. "In terms of credibility, it's evident that he's not credible because, first of all, he has been implicated in the smuggling of drugs," Aquino said. 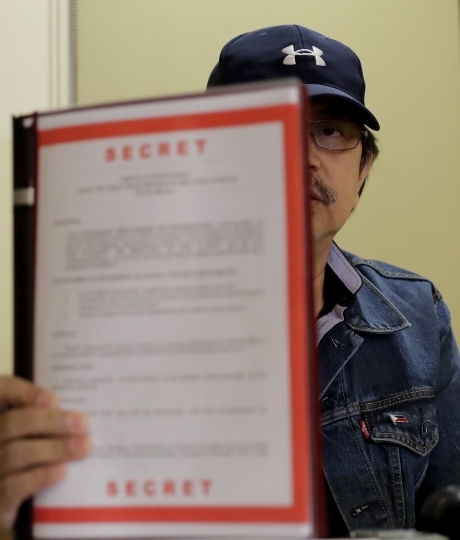 Acierto's confidential report about the alleged drug links of the two Chinese contained many details, including the involvement of one of them in the establishment of a secret methamphetamine drugs manufacturing laboratory that was raided by authorities in 2004 in southern Davao city, where Duterte served as a longtime mayor before rising to the presidency in mid-2016. Police have not said if they investigated those specific allegations or what they found out. Profiles of the two Chinese provided by Acierto to reporters said they were similarly involved in the "manufacturing, financing, the importation, transhipment and local distribution of meth or shabu," referring to the local name of the powerful stimulant. Acierto said he made a video message about his findings and contacted the media to make them public to be sure the potential danger the two men posed would be dealt with even if he gets killed. He did not elaborate on the death threats but said they forced him to go into hiding with the help of friends and church people. Acierto, who spent 18 years of his 33-year police career in anti-narcotics work, said he initially welcomed Duterte's passion to combat illegal drugs. But he said he later realized that the president's crackdown took a wrong approach by targeting mostly poor drug suspects instead of addressing the "supply side" by going after drug producers, financiers and largescale traffickers. "Maybe the killings are not the solution and most of those killed belonged to the lower classes," Acierto said. "If there's supply there will be addicts. Will they annihilate all these Filipinos?" More than 5,000 drug suspects have been killed in what the police reported were gunbattles that ensued during drug raids under Duterte's crackdown. The killings have alarmed Western governments and human rights group and sparked two complaints for mass murder before the International Criminal Court. Duterte denies condoning extrajudicial killings but has openly threatened drug suspects with death. Associated Press videojournalist Cecilia Forbes contributed to this report.